Say "I Love You" with a Sawdust City sign! 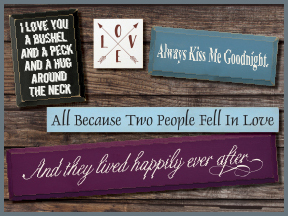 Show your sweetheart you love them all year 'round with a sign! Some are sweet, and some are silly, but all are solid wood signs! With over 40 colors to choose from, your solid wood sign from Sawdust City will look great anywhere!